On a day like today where the heat index is through the roof and you can barely breathe outside because the humidity feels like you are living in a Bikram Yoga class, we can only stomach the thought of light fare. Something green and something good. This seared ahi tuna salad is absolutely to die for and will not put you over the top with heaviness. Mission. Accomplished. Enjoy and enjoy your weekend loves! Sprinkle both sides of the tuna with coarse sea salt and pepper. Heat a cast-iron skillet to medium-high heat, drizzle the pan with a bit of olive or sesame oil. Place the tuna steaks on the hot griddle and brown them for 1-2 minutes per side to give the meat a nice cooked edge. Remove the pan from heat and allow it to sit for a few minutes before slicing with a very sharp knife. In a blender or food processor, combine the ginger, garlic, wasabi or mustard, honey, soy sauce, and mayonnaise until very pureed. Drizzle over everything. Toss together the arugula, edamame, and clementines. 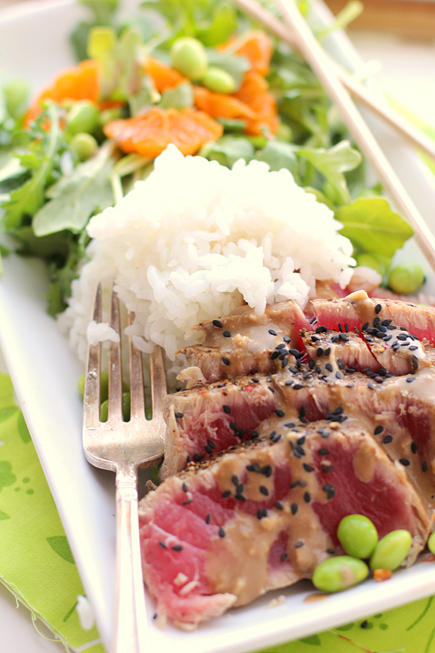 Serve with sticky rice and sliced seared tuna. I love seared tuna. Such a great light meal. Your blog looks fabulous! Looks good! You can come see the antlers I did over a year ago!